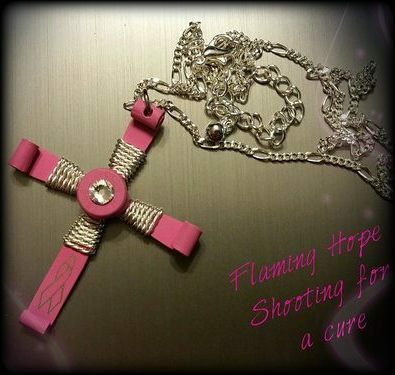 Shooting for a cure - .223REM/5.56MM bullet casing cross necklace with wire wrap, 16" fine Figaro chain and geniune Swarovski crystal. Cross is made from complete casing and is one solid piece with no soldering. Stones are genuine Swarovski Crystal.